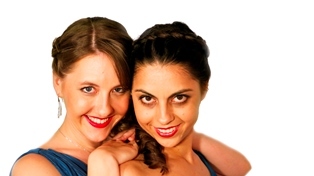 The Görög Sisters piano duo was formed spontaneously given the fact that both sisters in the family played piano. The backdrop to this duo’s musical beginnings is the Görög family’s deep love for the music and the sisters’ affection for each other. At first playing the piano was no more for them than having fun. Noémi, the older sister was eight years old when she started playing, but as younger sisters often do, Enikő, aged only four at that time, immediately started copying her older sibling. This was the start of what was to be a lifelong joint career in music. Soon Noémi was teaching her sister all the skills she had learned in her piano classes at the music school, with Enikő faithfully repeating everything she was shown. Following the sisters’ first stage appearances the duo received great positive feedback, both from the general public as well as from professional critics. All reactions have had one thing in common: when the two sisters play, they communicate perfectly with each other through music, creating a unique and amazing combination of two completely different musical personalities. Given that both sisters studied in Belgrade at the University of Arts, Faculty of Music in the class of Professor Ninoslav Živković, the duo has continued their cooperation appreciating his mentorship for years. The piano duo attended master-classes held by Arbo Valdma, Márta Gulyás, Imre Rohmann, Luis Fernando Perez and Jacques Rouvier, Tami Kanazawa and Yuval Admoni. The sisters have held concerts in Serbia, Hungary, Slovakia, Italy, Norway, Romania, France, Austria and the USA . They have recorded music for various radio and television studios including: Pannon RTV (Subotica), RTV (Novi Sad) in Serbia, MTV1 (Budapest), Duna TV (Budapest), MR3-Bartók Rádió (Budapest) in Hungary and Radio Vaticana (Rome) in Italy. In 2015 the Görög Sisters piano duo recorded their first CD in Belgrade in the great hall of Zadužbina Ilije M. Kolarca with Studio R88, Belgrade. The CD contains pieces by Wolfgang Amadeus Mozart, Camille Saint-Saëns, Béla Bartók and Witold Lutoslawski.